Just before Halloween, NASA's Juno spacecraft performed its 16th close flyby of Jupiter, snapping images just 4,400 miles above the planet's clouds. The timing couldn't have been better, because there is definitely a spooky feel to the high resolution color-enhanced image that the space agency recently shared of the planet's North Temperate Belt. According to the Juno team, there are a few things happening amidst the crazy swirls. In addition to bright white "pop up" clouds, there is an anticyclonic storm raging that is known as a white oval. 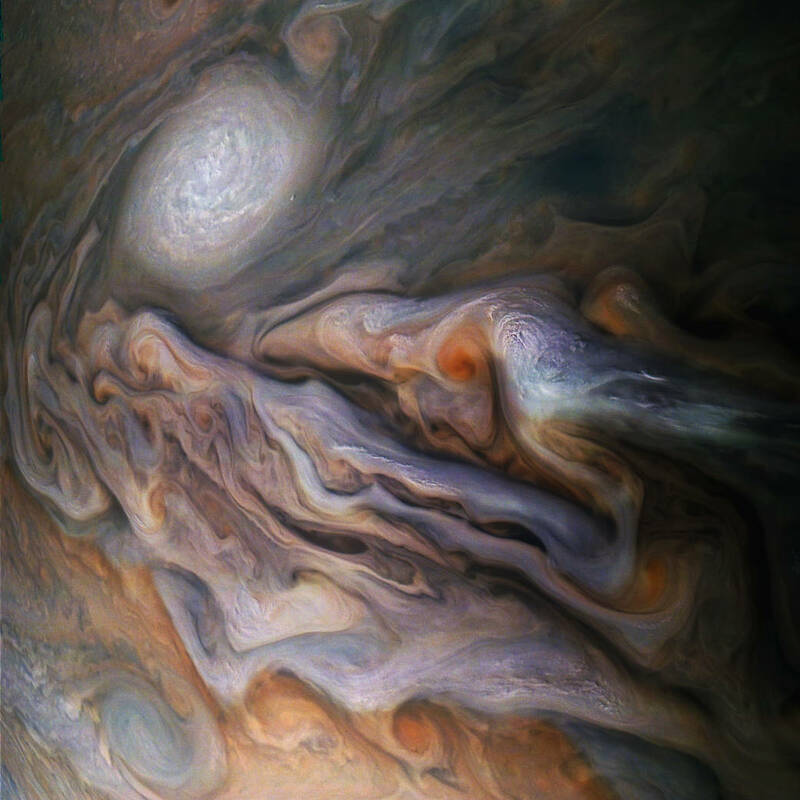 There is something about the human imagination that causes us to always see things in clouds, and the top down view of Jupiter's clouds is no exception. NASA's Jet Propulsion Laboratory shared on Twitter that a section of the image looks like a dragon's eye, and they asked followers to share what they see. Responses so far range from squids, to Van Gogh's "The Starry Night" painting, to a diplodocus, to even the Virgin Mary. What do you see? The Juno spacecraft launched back in the summer of 2011 and has been doing a lot more than taking cool photos for cloud watching Twitter users. From the recent detection of atmospheric wave trains, to providing closer than ever looks at the planet's disappearing red spot, the data from the Juno missions has already greatly expanded our knowledge of the planet and there are still a few years left thanks to a mission extension announced this past June. "With these funds, not only can the Juno team continue to answer long-standing questions about Jupiter that first fueled this exciting mission, but they'll also investigate new scientific puzzles motivated by their discoveries thus far," NASA's Science Mission Directorate associate administrator Thomas Zurbuchen said of the $1.1 billion program. "With every additional orbit, both scientists and citizen scientists will help unveil new surprises about this distant world."